Every employee at your hotel must have this effective tool to get more reviews. If you're not using this tool, you're losing money. Hand these cards as a personal touch point to ask for reviews. Everyone at your hotel should have their own personalized cards. To achieve a great online reputation, your entire team must be involved in generating reviews for your business. The more team members are involved, the more reviews you get! 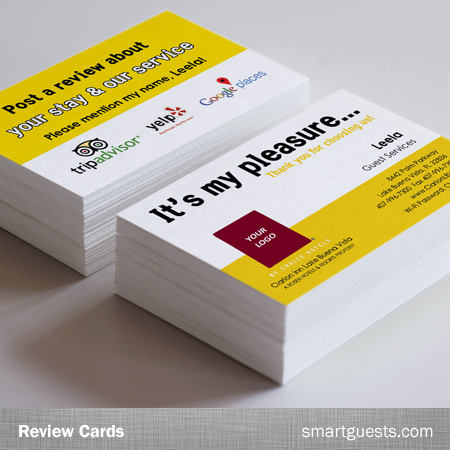 Our popular Review Cards will empower your staff to be more proactive in asking your guests for reviews. Empower any team member including front desk, breakfast hosts, maintenance and other departments to ask for reviews using this tool. Providing an employee with a these cards also boosts morale and shows that your company cares about their long term success. Custom design Review Cards with your business's branding and contact information on front. Looks like traditional business cards, only better! They have been customized with details at the back to prompt customers to publish a review about your business. Turnaround time is usually 3-7 business days See more delivery options.